I probably should be trying to use the countdown to Christmas to watch every little thing that I’m eating but who am I kidding, I’m only planning on eating loads more and still fitting into a few really cute plus size outfit – Oh the joys of being plus size! The funny thing is, I’ve always pretty much hated TGI Fridays… it has always reminded me of a teen hangout which served watered down cocktails although praised as being a ‘high-street cocktail bar’ plus the food isn’t exactly healthy…and yes that’s coming from me. I love great tasting, healthy food which doesn’t scream ‘fat!’ So after some hesitation, I ventured down to the Westfield Stratford TGI Fridays ahead of booked tickets to see The Hunger Game: Mockingjay Pt 2 and tested out TGI Friday for the first time in I think, 10 years! What enticed me was of course being able to review it the restaurant, but also to get into the spirit of Christmas with TGI Fridays all-new #JingleEffect Christmas menu, offering twists on festive classics, including a unique Christmas burger, devised by award-winning head chef Terry McDowell. 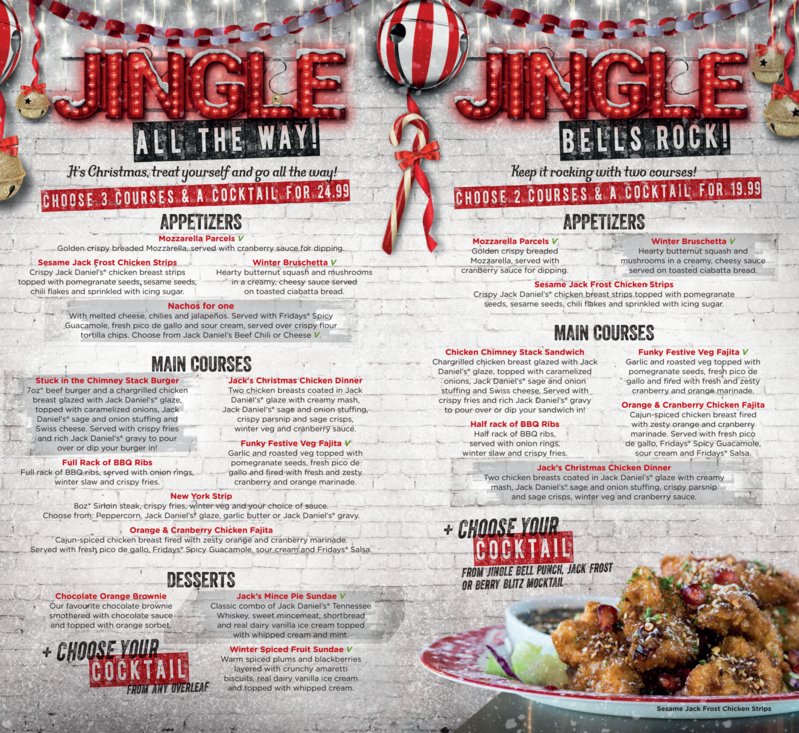 You might also be surprised to know that this is TGI Friday’s first ever festive menu and combines smoky, bold flavours with traditional festive influences, giving diners the opportunity to try something completely different this Christmas season, when celebrating with friends and family at Fridays. After waiting what felt like an eternity for our seats and being turned (shut) down at every opportunity to ask how long we’d be waiting, we were finally seated after a little mention ‘ahem’ of reviewing the joint and due to the wait for a table vs our cinema screening time, I didn’t really get a good chance to really devour the food the way I have done in previous reviews, but rest assured, my party and I tried as much as we could before we had to rush out! It isn’t as review without a selfie! We were given a run through of both the new three course Christmas menu priced affordably at £24.99 & the standard TGI Friday menu by our lovely waitress Allie however I went straight big one and ordered the new! Stuck in the Chimney Stack Burger­, which mixes traditional Christmas foodie favourites like sage and onion stuffing, chicken and gravy – all of which are infused with Jack Daniels glaze – with a 7oz beef burger, Swiss cheese and caramelised onions, all packed between two traditional TGI Fridays burger buns however the top bun had a sprinkle of sugar frosting! Strange but I liked the festive touch! 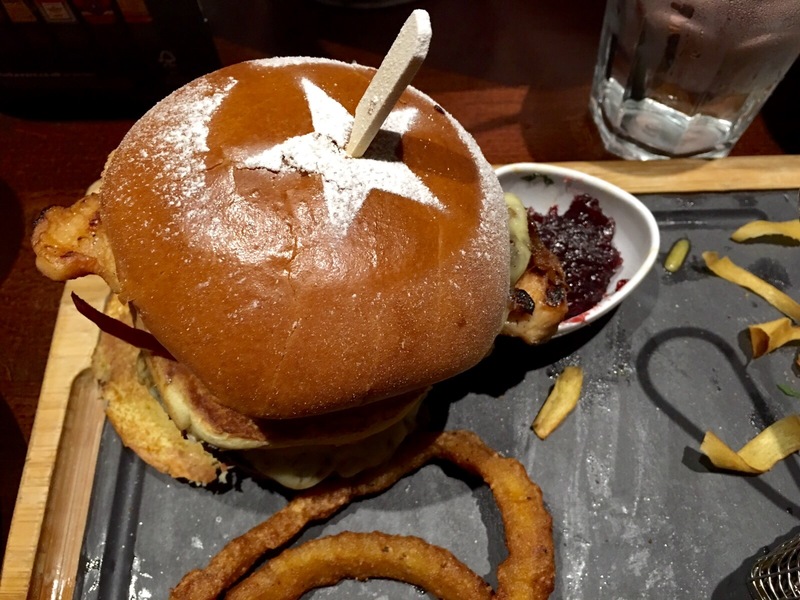 TGI are right in calling the Stuck in the Chimney Stack Burger­ a towering, flavour-packed festive feast because it is in itself however it was a little bit too much for me, wasn’t piping hot and lacked that gourmet burger taste I’ve grown so accustomed to. This meal also comes with fries…standard. As for the starter, although it came out all together, was the Mozzarella Parcels which I really loved however they came luke warm so there was no chance of taking stringy cheese shots on the camera. As part of the new menu, there are plenty of drink options with the limited edition cocktail range, developed exclusively for Fridays by Head of Bar, Adrian Astley. Cocktails available include the indulgent Rudolph Hardshake – made with Frangelico, chocolate sauce, vanilla ice cream, cherries and whipped cream – and the Purple Snowstorm – Havana Club 3 Year Old Rum, BOLS Blue Curacao, SKYY vodka and Chambord with sweet & sour and a drizzle of BOLS Grenadine with a sugar rim. I kept it simple however and ordered the TGI friday Long Island Ice Tea which was surprisingly sweet abut again not too strong. Being struck for time though, I missed out on the Jack Daniel’s® Mince Pie Sundae. Who fancies giving it a trial run and letting me know how it tastes?